Visiting your local library, meeting the librarian, and finding out about available programs and technology are all great steps toward getting the most out of this helpful place of literacy learning. Have you visited your local library lately? Although library resources vary greatly depending on the branch, they all offer invaluable resources for free. Taking advantage of the services your local library has to offer is a great way to support your child’s reading development. Below are four steps families can take to learn more about their local library. 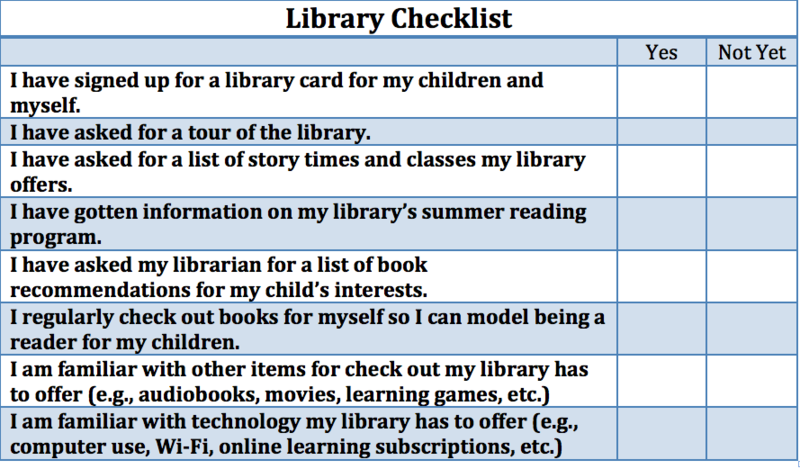 Not only will this list help families to become familiar with their library’s resources, but it also will help them make library visits more routine. Getting signed up for a library card sounds like a “no-brainer,” but it is a great first step in making library visits routine and worthwhile. How: Check to see if your library allows children to get their own cards. This can help them learn the responsibility of checking out materials and bringing them back on time. Libraries typically make signing up for a card a very simple process. Your librarians know the library inside and out. They have a wealth of knowledge and experience, and they are eager to share with library patrons. How: Introduce yourself (and your family) to your librarian. Make sure to ask your librarian for a quick tour so you can learn about all there is to offer. Share your children’s ages and reading interests, and ask if your librarian has any recommendations of books for your children. Libraries typically have programs that support reading development for children. These vary from branch to branch, but they are definitely worth checking out. How: Visit your library’s website or ask a librarian if they offer any story time or book club programs for children. Ask how to sign up for a program that works for your family. In addition, ask about any reading incentive programs they offer. Many libraries offer summer reading incentive programs to motivate children to read. Libraries offer various types of technology that might include computer use, Wi-Fi, or online learning program subscriptions. How: When taking your library tour, be sure to ask your librarian about any technology services the branch might offer and how to sign up to use them. Some online services might need to be used while at the library, but some might be available online from your home computer. Your library has many resources to support children’s reading development. Regularly taking advantage of the services your library offers will help keep your child motivated to read. All of these services are free of charge and are waiting for you to use them! The following is a checklist to use to help you ensure you are familiar with all the types of resources your library has to offer.